Tibetan Buddhism originated out of the Indian Tantric Buddhism and native Bon religion as early as the seventh century and all cultural and traditional aspects of the country are related in some way to the Buddhist religion. Due to the predominance of Tantra and its rich heritage of symbolism, Tibetan symbols flourish all around the country, linked to Tibetan Buddhism, culture and traditions, and are given great significance and importance. In the Buddhism of Tibet, symbols are a part of every day living. In the early centuries, statues of Buddha were not in use; Buddhist art used images to symbolize Buddha and his teachings. As it spread, Buddhism came into contact with the cultures of different countries becoming further enriched by the contact. This is especially visible in Tibet where a very rich symbolic tradition was developed. Courtesy of Osel Shen Pen Ling. 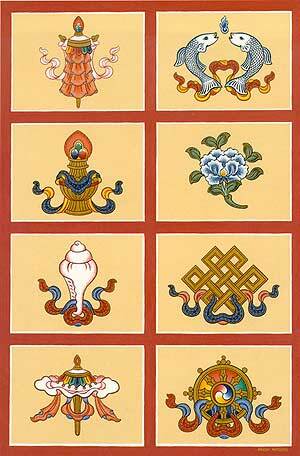 There are eight central symbols of Tibetan Buddhism known as the Eight Auspicious Symbols. You will find them everywhere in Tibet and in the exile communities. They are traditionally offered to teachers during long life ceremonies and are used in various forms of ritual art. 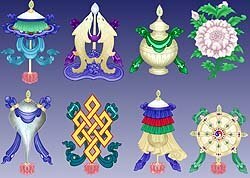 It is believed that each of the Tibetan symbols represents one aspect of the Buddha’s teachings and when appearing all together their powers are multiplied. 1. Parasol, depicted by the umbrella denotes royalty and spiritual power and is symbolized as the shadow of protection. The coolness of the shade cast by the umbrella symbolizes protection from the heat of spiritually harmful forces and suffering. 2. Golden Fishes, depicted by two fishes standing vertically with heads turned to each other, denotes good fortune, fertility and salvation. In Tibetan Buddhism the fishes symbolize happiness and fertility, conjugal unity and fidelity and are often given as a wedding present. 3. Treasure Vase is depicted by a fat-bellied vessel with a short slim neck and a jewel at the top denoting spiritual and material abundance. The symbolism is the association of storage with the satisfaction of material desires, a source of inexhaustible treasure. 4. Lotus, the lotus flower denotes mental and spiritual purity and is a poignant reminder of the Buddha’s teachings. The growth of the lotus from mud, through water to its final resting place in sunshine, symbolizes the progress of the soul or mind through the mud of materialism, the waters of experience and into the sunshine of enlightenment. 5. Conch Shell denotes the fame of the Buddha’s teachings. It is used to call the religious assemblies together, as a musical instrument and a holy water container. 6. Endless Knot, a closed graphic ornament comprising right angled intertwined lines that overlap without beginning or end, symbolize the infinite wisdom of the Buddha. It depicts continuity as the underpinning of the reality of existence. All eight symbols are incorporated in this beautiful design. 7. Victory Banner denotes the victory of the Buddha’s teaching and the triumph of wisdom over ignorance. 8. Wheel is one of the most important symbols in Tibetan Buddhism and represents the teachings of the Buddha. The wheel’s motion depicts rapid spiritual change brought about by his teachings. Do you have a question about symbols?